Looking for a new grill at a great price? If so, here are some points that you may want to consider before you buy. Sometimes patience prevails, especially when it comes to finding a great price on a grill. For many of us, the realization that it is time to buy a new grill happens around early spring and into the summer. This is also the time that the sales on grills peak, as do the prices. Waiting until the end of the summer season to purchase a new grill almost always results in significant savings of 40 to 70 percent off full prices. One reason the prices on grills drop significantly in late August and September is that retailers often use the same selling space for holiday merchandise, which starts arriving in stores as early as July. So a good rule of thumb is to keep an eye out for artificial Christmas trees in the stores, and then start shopping for a new grill. Locking down a price range that you are willing to fork out for a new grill before you go shopping will help you stay focused on the products within your spending range. If $300 is the maximum amount that you decide on, then avoid being oversold by avoiding the grills that are in the higher price points. It helps to research the pros and cons of the different types of grills so you can choose one that best fits your grilling style. Charcoal grills are less expensive than other grills, but the overall cost of charcoal briquettes and lighter fluid can add to the price, depending on how often the grill is used. Pros: Because of the intense heat that charcoal grills produce, the food often has a smoky, deep grilled flavor that is hard to reproduce when using gas grills. Cons: Charcoal grills take more time to clean and to heat up. There is also an increased threat of fire if the ashes are not properly discarded. Prices range from $100 to $300, although some models can be found for as high as $2,500. 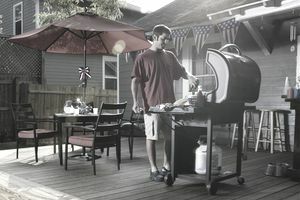 Charcoal grills usually go on sale before gas grills and the prices are slashed aggressively until the stores sell out. Gas grills are the number one choice for backyard grilling because they are fast to fire up and easy to maintain. Depending on the model, most gas grills will run on propane or can be hooked into a natural gas line. Pros: It takes very little preparation to start cooking on a gas grill, and cleanup is easy. Even the most basic models can last for years when properly cared for and protected. Cons: Foods cooked on gas grills will not have a deep, smoked flavor like charcoal grills produce. Prices range from $100 to $3,000. Small and mid-sized prices drop at the end of the summer season. The smaller the size, the bigger the markdown. Electric grills are a popular choice for people who live in apartments or condominiums where there are restrictions on using gas or charcoal grills. Electric grills work by plugging them into an electrical outlet. Food is cooked on the grill plates. Pros: The small sizes available in electric grills make storage easier. Cons: Cooking on an electric grill will not result in food that tastes grilled. Prices range from under $100 to as high as $500. Price reductions are conservative since electric grills are more of a year-round product compared to charcoal or gas grills. There are a lot of goods sold online that are cheaper than what you can find at local stores, but that isn't always the case when buying a grill. When comparing prices and services, one major consideration for grill buyers is the added expense of having it shipped. When online stores offer free shipping, it is important to ask if that includes free handling. Verify that the price is competitive with your local store prices. Some online retailers will occasionally absorb the cost of shipping by increasing the price of the product. Another consideration is the assembly of the new grill. Local stores like Lowe's, Home Depot, Sears and Walmart have stopped charging for grill assembly during certain times of the year. While there may be added advantages to buying a grill locally, it can limit the choices of the models that are available. Shoppers looking for high-end grills might find a better selection online. If buying online seems to be the best option, take the time to look for online coupons and free shipping days. The best local prices on grills will likely be found at retailers like Home Depot or Lowe's. If you don't mind a dent or two, check to see if you can purchase the floor models. The savings should be significant. The warehouse stores, like Costco, Sam's and BJ's Wholesale Club are also known for end-of-season discounts on grills, with discounts of as much as 70 percent off of the price. Other local retailers to consider are stores that handle close-out items like Kohl's, BigLots, Tuesday Morning and Sears Outlet stores. Sometimes the closeout stores are the first to mark down grills with the deepest discounts. When buying a grill from a local store, it pays to check the newspaper ads for store specials. Many times you can view your local store's weekly ads online. If your local store is sold out of the advertised sale products, check into buying online and receiving free "ship to store" services. If you do get a grill shipped for free to the store, see if they will also assemble your new grill for free. There is no reason to buy a grill at the full retail price. Waiting and watching for the prices to drop on the grill of your choice will pay off with significant savings.